“Poffertjes” are a Dutch culinary specialty you could compare with a mini pancake served with powdered sugar and creamy butter. They are best eaten freshly made by food stalls on city squares or on markets, events, festivals, or fairs. But luckily you can also make them at home. Poffertjes are made from buckwheat flour and yeast and baked in a special pan with little circular cavities. In the backing process you flip over your Poffertjes with a two-pronged fork. Poffertjes are moist and chewy inside. Crispy outside. They’re downright addictive, super popular and everybody loves them even better than the bigger pancakes. 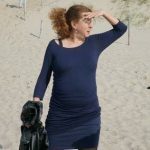 When do you eat Poffertjes? Well, this Dutch delicatessen is best eaten every minute of the day. Do not hesitate eat them for breakfast, for lunch or diner, just eat them when ever you want. Poffertjes are easy to make. They puff up while there baked. A special pan is not necessary but its nice and easy if you have one the one and only “Poffertjespan”. If you don’t have a special Poffertjes pan use a good size frying pan. Traditional Poffertjes are served with powdered sugar and butter but you can also drizzle sirop, Nutella, ice cream, strawberries or a puree with mixed berries over the Poffertjes. I like them best, steaming hot with powdered sugar and a good scoop of butter. 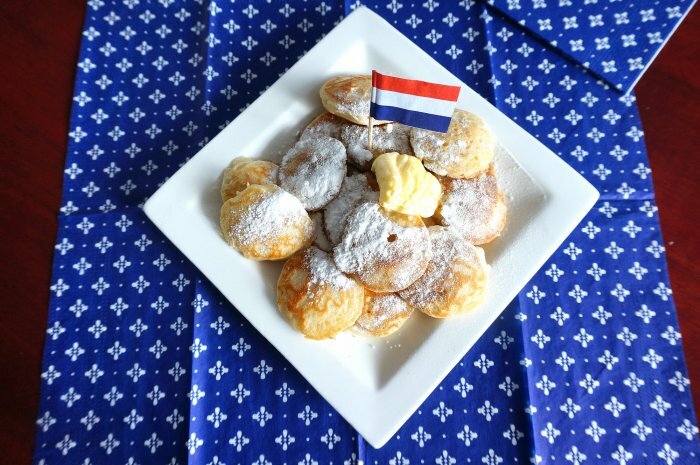 And now I am going to share my Poffertjes recipe with you, so you can make them at home and make your family addicted to this Dutch speciality. Original kitchen gear to prepare Poffertjes. 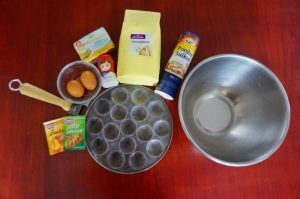 Take a mixing bowl and mix the flour, sugar and salt. After mixing add the yeast and then the milk. Watch out, the salt must not come into direct contact with the yeast. Mix well with a whisk to a smooth batter, mix well so there will be no lumps. Finally add the egg, mix well and cover the bowl with a kitchen towel. Put the bowl in a warm place for an hour so the mixture can rise. After an hour you fill a special batter bottle, can or pastry bag with the batter. If you don’t have these kitchen tools just use a couple of spoons to put the batter in the Poffertjespan. Fatten the Poffertjespan with unsalted butter. If you don’t have a Poffertjespan use a normal frying pan. Put the heat on medium. When the pan is heated squirt or scoop the batter in the pan. After a few minutes, when the underside is cooked golden brown, gently loosen them with a fork and flip them over. When both sides are backed, place the Poffertjes on a plate with the best butter you can get and put on a big load of icing (powdered) sugar.